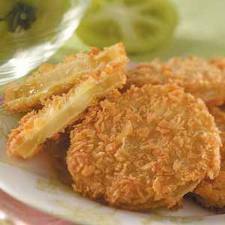 Fried tomatoes make a nice side dish or go well with a salad course but I think they shine on BLTs. Fried green tomatoes, cooked bacon, lettuce, lightly toasted sandwich bread and a pecan-bourbon mayonnaise make for an amazing BLT. Slice the tomatoes crosswise, 1/3 to ½ inch thick. Press each piece into a plate to coat both sides. Heat the oil in a wide skillet over high heat until hot enough to sizzle a drop of water. Add the tomatoes, reduce heat to medium, and fry on both sides until golden. Remove to a paper towel lined plate, season with salt and pepper. Serve warm.